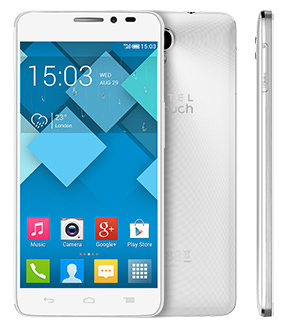 Alcatel One Touch Idol X+ has been launched in India at very attractive price. The One touch Idol X+ will compete with Micromax Canvas Knight A350 , Samsung galaxy s4 and Wickedleak Wammy Neo , considering the specifications. The Idol X plus comes with some vigorous features. It draws the strength from 2GHz Octa core CPU based on Mediatek MT6592 chipset integrated with Mali 450 GPU. It rusn on Android 4.2 Jelly bean OS , company has customize the UI to please the user. The One-Touch X-+ has 5 inch display having FHD 1080p resolution. It packs with a 13MP AF camera with Flash and a 2-megapixel secondary camera. It is just 8.1mm thick and has 2500 mAh battery. The mobile phone is accomplished with 2GB of RAM and 16GB of internal storage. The display has 170 degree viewing angle and the handset has brushed metal frame, which makes it more robust. You can record Full HD 1080p videos from the handset. The Alcatel X+ has 3G, WiFi, Bluetooth, GPS, DLNA, WiFi Direct and micro USB with OTG connectivity. It also features Hi-Fi sound for crystal clear audio playback. The OneTouch X-plus is available in Blue Black and White colors. You can Buy It online from Flipkart for INR : 16,999. It is better than Canvas Knight and other smartphones at this price with better specs and more battery life.